Map of the West Bank that is under authority of the Civil Administration. Israel ended exercise of authority over the Gaza Strip in 2005. The Civil Administration is a part of a larger entity known as Coordinator of Government Activities in the Territories (COGAT), which is a unit in the Defense Ministry of Israel. Its functions have largely been taken over by the Palestinian National Authority in 1994, however it still continues a limited operation to manage Palestinian population in the Area C of the West Bank and coordination with the Palestinian government. After 2002, the distinction set forth in the Oslo Accords restricting Israeli military operations in area A was de facto terminated. The creation of a civil administration for the West Bank and Gaza Strip was incorporated within the Camp David Accords, signed by Egypt and Israel in 1978. The Civil Administration intended to exchange the military government Israel had established in 1967. The Camp David Accords did not include the Palestine Liberation Organization (PLO) in the talks over issues of the Palestinian-claimed territories. "We hereby establish a Civil Administration in the region [West Bank and Gaza]. The Civil Administration shall run all regional civil matters, correspondingly to this [Military] decree, for the wellbeing and for the sake of [local] population, and with the purpose of providing and operating the public services, considering the need to maintain a proper governance and public order". Through the implementation of the Oslo Accords agreed upon by Israel and the PLO, the Civil Administration transferred some of its governance capacities to the Palestinian National Authority in 1994. Since 1994, the Civil Administration has largely focused on matters involving the issuing of movement permits. Upon the implementation of Israel's unilateral disengagement plan from the Gaza Strip in 2005, the Civil Administration has exercised authority exclusively in the West Bank. The Israel Defense Forces description of the mandate of the Civil Administration purports that "the unit acts as a source of information integrating human quality and technological progress which coordinates activities of government bureaus, the IDF, and security establishments opposite the Palestinians through the application of government policies in factors pertaining to civilians. Additionally, the "MATPASH" Unit promotes humanitarian issues, infrastructure projects, and economical projects." The Civil Administration is practically a "counterpart" of the Interior Ministry of Israel, and operates with its nine Israeli – District Coordination Offices (DCO), operating in the West Bank. The Civil Administration is responsible for all administrative aspects of the local population within Area C of the West Bank, and is responsible for coordinating with the Palestinian Authority, which has full administrative authority in Area A, and limited authority in Area B, as per the Oslo Accords. 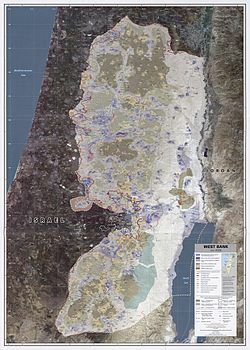 After 2002, with Operation Defensive Shield, the agreement in the Oslo Accords disallowing Israeli military operations in Area A was effectively abolished by the latter. The only part of the West Bank which the IDF does not enter is the Palestinian Presidential compound, the Mukataa inside Ramallah. As a working rule, the Palestinian security forces are left to operate by day, and Israeli raids take place in this area during the night. Among other things, it is responsible for the entrance permits from the West Bank to Israel, travel permits within the West Bank, and work permits (for Palestinians seeking to enter from the West Bank to Israel in order to work). It also decides on matters concerning the approval of new and already built housing units in settlements. The Civil Administration that operates as part of the COGAT unit receives its budget from the Israeli government. ^ a b c Ahron Bregman (5 June 2014). Cursed Victory: A History of Israel and the Occupied Territories. Penguin Books Limited. ISBN 978-1-84614-735-7. ^ a b c d Neve Gordon (2 October 2008). Israel's Occupation. University of California Press. ISBN 978-0-520-94236-3. ^ a b Nahum Barnea, 'Beitunian nights: The IDF in the West Bank,' Ynet 18 March 2016. ^ a b Yvonne Schmidt. Foundations of Civil and Political Rights in Israel and the Occupied Territories. GRIN Verlag, 2008. P. 348. ^ Translation of the text: Israel Military Order No. 947 Concerning theEstablishment of a Civilian Administration Archived 2014-01-12 at the Wayback Machine. Israel Law Resource Center. ^ Thomas L. Friedman (1 April 2010). From Beirut to Jerusalem. Farrar, Straus and Giroux. p. 238. ISBN 978-0-374-70699-9. ^ Helena Lindholm Schulz (1999). The Reconstruction of Palestinian Nationalism: Between Revolution and Statehood. Manchester University Press. ISBN 978-0-7190-5596-6. ^ a b Anne Le More. International Assistance to the Palestinians after Oslo: Political guilt, wasted money, Oxon, England, UK; New York, New York, USA. Routledge, 2008. P. 190. ^ "Coordinator of Government Operations in the Territories". Israel Defense Forces. 2010. Archived from the original on December 17, 2010. Retrieved 2010-12-31. ^ "Statement by the spokesperson of the EU High Representative Catherine Ashton on Israeli settlement approvals of 22 February" (PDF). European Union High Representative. 2012. Retrieved 2012-02-25. Wikimedia Commons has media related to Israeli Civil Administration.